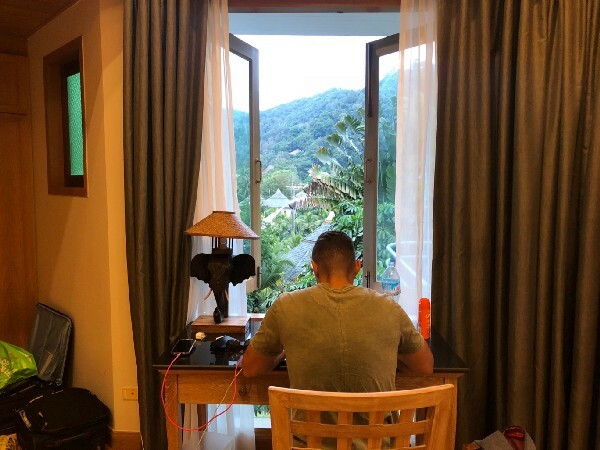 I always try and incorporate a few days of play into my global business travels, striving for not just work-life balance, but work-life integration. Rather than take a four to six-week vacation, I prefer many three to five day jaunts throughout the year. This keeps me on top of my game all year round and gives me frequent jolts of perspective and gratitude, keeping me 100% focused when I am behind my laptop. Most recently, I found myself in Hong Kong to deliver a number of innovation workshops for Standard Chartered Bank and FWD Insurance. On this particular occasion, I decided to spend the following weekend in Hong Kong before flying out to Thailand for a few more days of play interspersed with work. While I was in Hong Kong, I found some time to get away for what turned out to be a 20-kilometre (and 180-floor) hike on nearby Lamma Island, home to a fishing community with mouth-watering seafood and pristine beaches. 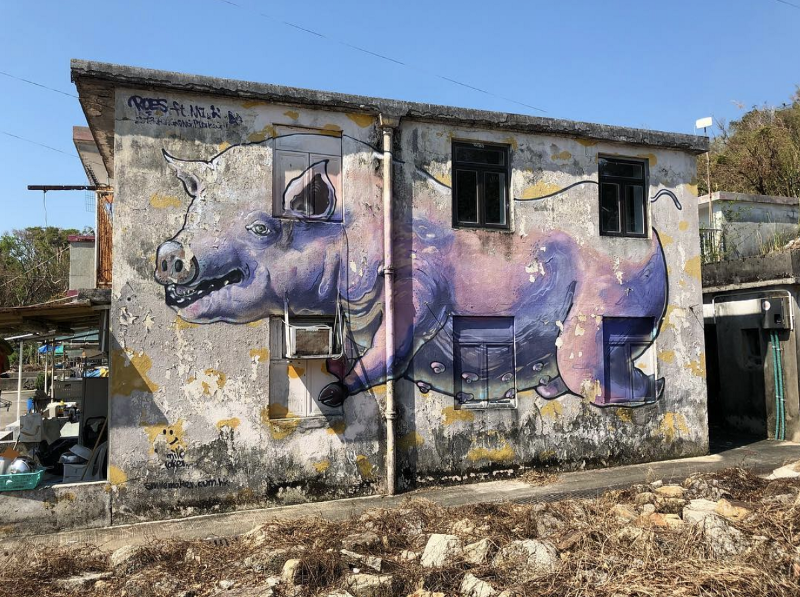 I found myself jogging through one of the many far-from-glamorous rural fishing villages on this island when I stumbled upon a giant mural of a pig (below). Now, if I had seen this in Melbourne which is awash with world-famous murals by the likes of LushSux and numerous other graffiti artists, I might have looked twice, smiled to myself and moved on. But having come across it unexpectedly in this rural fishing village, I was absolutely delighted and I felt compelled to stop, take a photo and share it online. The power of the unexpected. Argh me Hearties, Here Be Treasure! A few days later, I found myself in Krabi in Thailand, and set sail for a day of snorkeling and exploring the white sand beaches of Koh Bu Bu. During this island hop, my crew was summoned to the boat to head off for our next stop. That next stop was Morakot Cave. 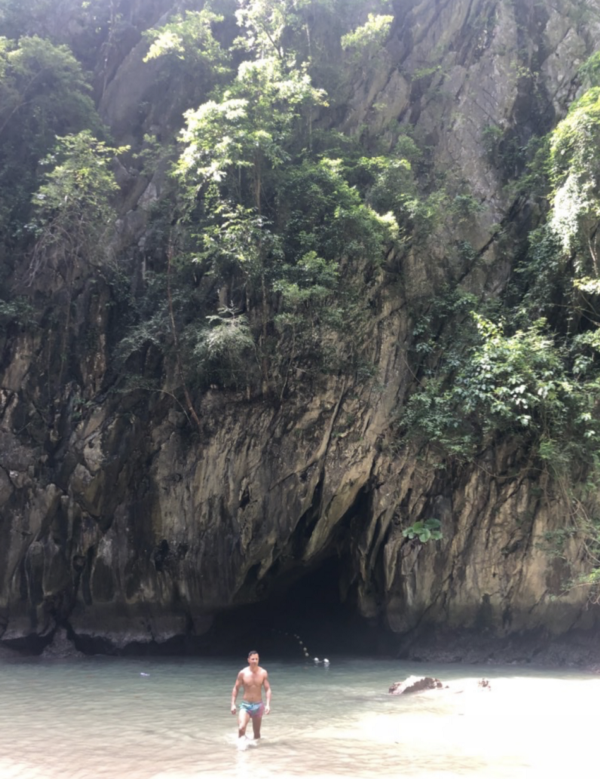 This particular cave was immersed in the water and was a gateway to a secret beach that for generations had been a hiding spot for the treasure of Thai pirates. We swam through the cave, as waves came crashing through — giving me slight and irrational anxiety at the prospect of the remote chance of a tsunami filling the cave up with water — and enjoyed a moment at the secret beach. This was an absolutely memorable experience, and it was delightful — not because of the scenery — but because the day prior we had been told by a tour organiser that due to weather conditions we wouldn’t be able to explore the cave. We had no idea we’d actually be venturing inside until moments before. The power of the unexpected. The next day, I rode a scooter to Mu Ko Lanta National Park for a nature hike which took us an hour and took in awesome views of the beach. Afterwards, we decided to ride to a much talked about waterfall. Upon arrival at the site, we were told it was a short walk to the waterfalls. Turned out that short walk was another one hour hike! This hike was quite the adventure, devoid of any signage, and greeted us with lots of treacherous terrain and river crossings. 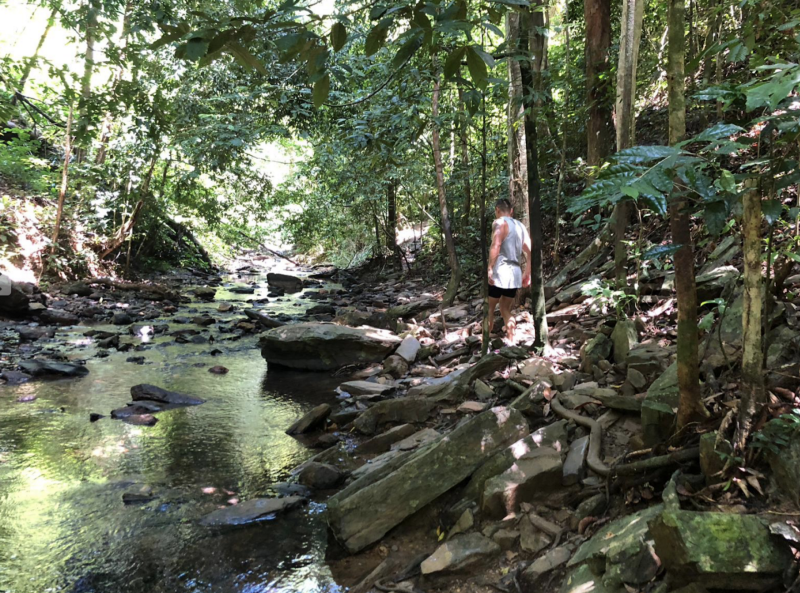 The waterfalls’ inviting freshwater pond was a welcome reprieve after sweating up a storm hiking through the hot, sticky jungle for an hour — unsure if we were even going the right way the entire time — but the hike itself, the unexpected journey rather than the expected destination, was delightful. …me thinking ‘I hope we’re going the right way’. The following day, while kayaking in Tungyeepeng Mangrove Forest, we were given “food for monkey’” by our tour guide, who said little else. 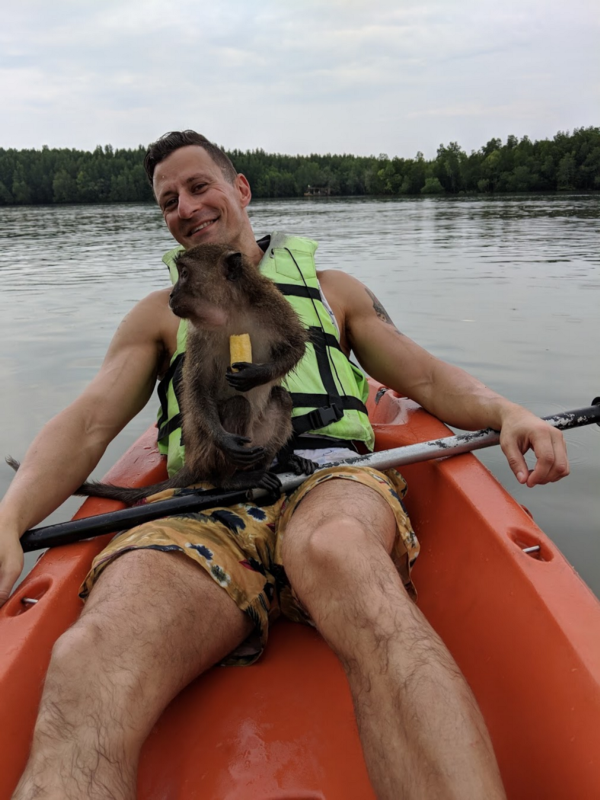 Little did I know that the monkeys would literally jump out of their trees, swim to our kayaks and climb aboard, stealing our food and standing on our heads, with one monkey making itself incredibly comfortable on my lap and another, relieving itself on a friend’s lap. Totally unexpected, and totally delightful — well, maybe not for my friend. Me and my new buddy. I thought he liked me but then I ran out of food. Finally, while at the Mangrove Forest, I had the opportunity to visit a fish farm and feed the fishies. Little did I know that these fish were Tiger Fish and literally spat water at you, much like a Super Soaker, as you held their lunch a foot above the water. Totally unexpected and totally delightful. What’s the opposite of delighting with the unexpected? Falling short of delivering what’s expected. For example, while in Krabi, we stayed in what is considered a five-star hotel locally (for the price of a three-star hotel in the west! ), only to discover that despite the US$100 a night pricetag, using our room’s safe would set us back an additional US$2 per day. One could not help but respond to this with an audible “are you f*cking kidding me?”, or at least, I couldn’t. Of all my experiences in Hong Kong and Thailand over the past week, it wasn’t the as advertised that I will remember in five years time and that I will be telling others about (or blog about). It was not the gorgeous Thai beaches or the nightlife in Hong Kong, it wasn’t the first hike or the scooter ride, it was definitely not the comfortable resort we stayed at. It was the unexpected moments. Whatever you do, whoever you are, you can introduce the unexpected to delight your customers, to delight your employees and to delight your loved ones. As a leader of a team, there’s lots to think about with respect to employee engagement and wellness. However, many companies are spending big on perks that many employees have come to expect and take for granted. Such programs don’t necessarily delight employees or build loyalty, they simply help you compete by offering what everyone else is. In order to go above and beyond, it’s not necessarily expensive yoga memberships and free lunches that matter; it’s the simple things. For example, I like to delight my team with unexpected half days off, or a special Messina ice-cream delivery on a sunny day, or by gifting a book to an employee who did a great job on something that day. Whenever I do this, people don’t need to say anything — they’re visibly thrilled because they weren’t expecting it. While a payrise, a bonus or a promotion are all nice, they don’t delight unless they are unexpected. How might you delight your team with the unexpected? As an entrepreneur or product executive in an increasingly competitive, fast-changing business and technology landscape, you constantly need to be adapting to changes just to stay afloat. As such, delivering an exceptional customer experience is imperative, especially in a world where fast-growing tech companies, who have optimal customer experiences at their core, are eating up what was once the market share of traditional incumbents; especially in a world where customers can tell not only their circle of friends, but thousands of people online if they have a lousy experience. Part of delivering an awesome customer experience is delighting customers. What’s the best way to delight customers? Deliver what they don’t expect. If I’m delivering a SaaS product to my customers, I might go above and beyond by offering training that wasn’t advertised. I might offer twice the number of user licenses agreed. I might offer a number of additional value-adding features that previously weren’t discussed. There are many things I could do that would serve to leave customers delighted, not by delivering what is in a contract, but by delivering what isn’t in a contract. It’s not enough to simply acquire customers. You might be great at pulling the wool over a customer’s eyes, only to have them see the forest from the trees, and defect shortly thereafter. That’s no way to build a sustainable, profitable business. In order to build a thriving business, you need to do so around the retention or existing customers and the referrals of new ones. 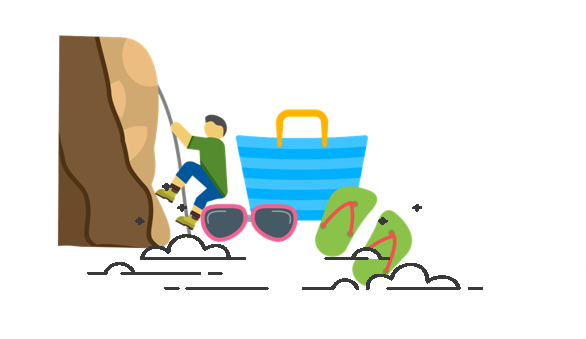 Platforms like Airbnb track not only the number of nights booked but also the number of nights returned because if guests have a lousy first experience, they are unlikely to use the platform again. This is why Airbnb has each new employee spend the first week of their tenure as a guest in an Airbnb listing, to collect insights and share opportunities for improvement. Perhaps an Airbnb host could delight customers by finding them online and determining that they like a particular brand of whisky and having a fresh bottle waiting for them on the kitchen table upon check-in. That guest is likely to not only give a 5-star review but come back again and tell their friends. How might you delight your customers with the unexpected? People often get together and revel in what’s known as the honeymoon period. Everything is new and exciting. After a while though, couples tend to normalise their partner’s positive qualities and normalise the relationship. Many often wait for Valentine’s Day, birthdays and other special occasions to do something nice for their partner — when it is totally expected. Rather than wait for such days, why not do things when they least expect it? Surprise them with a bouquet of roses on a random Wednesday, just because. Get them courtside tickets to their favourite team’s next game, just because. I was recently surprised with a box of Quest protein bars while in Thailand, which for a modest investment of $30, delivered a kind of delight that an expensive gift on my birthday never could. It is the unexpected that delights and that keeps that honeymoon period fire burning for longer and leaves both parties feeling more psychologically satisfied and less likely to go walkabouts or grow disgruntled with the relationship’s lack of apparent excitement or freshness. How might you delight your lover with the unexpected? Finally, after a morning workout in Krabi, Thailand, I set out looking for a passable coffee. Being from Melbourne, I dismissingly walked past a Starbucks and a Coffee Club, looking for real coffee. I didn’t expect real coffee in an island of a Southeast Asian nation, and stumbled upon a cafe, that while it didn’t look like much from the outside, I learned was founded by an Australian expat. And the strong latte I had was not too dissimilar to Melbourne’s finest. And I my friends, was absolutely delighted. 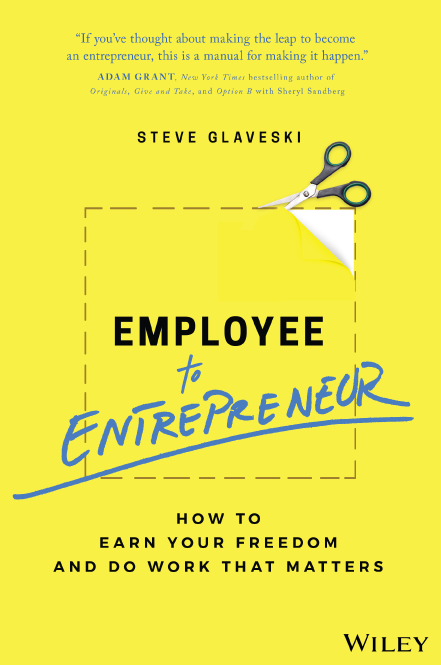 If you’re looking for more work-life integration in your life, pre-order my forthcoming book Employee to Entrepreneur, out globally through Wiley in January 2019.